Average Weight	: 17 - 23 lbs. The Bedlington Terrier was developed in the country of Northumberland, England. 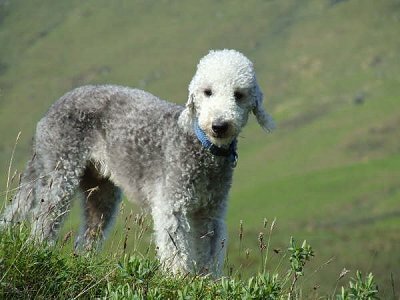 The original name for the Bedlington Terrier was the Rothbury Terrier, named after the district of Rothbury located on the English border. About 1825 the breed was renamed the Bedlington Terrier after the Bedlington Mining Shire. The breed was a prized hunting dog of foxes, hares and badgers. It was also used as a vermin hunter by the miners of Bedlington. The miners exploited its gameness as a fighting dog in the pits and hunters used them as retrievers. Both the Otterhound and Dandie Dinmont Terrier are possible contributors to the breed. Some breeders, especially those in England will cross Bedlingtons with Whippets and Greyhounds to produce what they call Lurchers. •	Hypo-Allergenic ~ great for dog lovers with dog hair allergies. •	This 'lamblike' looking dog is entertaining and has an 'opinionated' disposition. •	Bedlingtons are Inquisitive, Intelligent, Alert and aggressive to animals & pets smaller than them. They are known for being very 'fast' when chasing down small animals. •	Love to be the center of attention in the family and 'clown' like. •	Happy to be a 'couch potato'. •	Can be good with children, if socialize properly and exposed to them from puppyhood, otherwise needs supervision around toddlers. Doesn't understand 'rough housing' that may occur with children. •	Can be fierce fighters if challenged by other male dogs. •	Often described as 'one-person' dogs. •	As a Terrier ~ they love to 'dig'. •	Require a fenced yard. •	Intelligent, moderately easy to train, but can be stubborn.